I have never made a coffee cake for this here blog and yet it is one of my favorite things to eat. I like lots of cinnamony sugary streusel topping. And a cake that is tender and slightly dense and not overly sweet. And did I mention cinnamon? It just makes life so cozy. 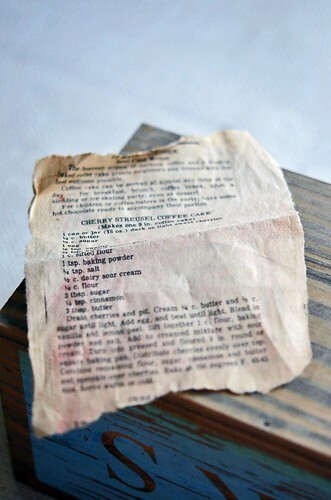 I found this recipe in my mom’s recipe box. I have rummaged through it numerous times, always looking for something to spark my interest or to catch my eye/stomach. The perfect penmanship on each index card kills me…whether done in haste or with care, it is even and practiced. It is one of those small things in life that just gets me… The handwriting belongs to my mom, my aunts, and grandmothers….all of who have lovingly written out their favorite recipes on 4 x 6 index cards. Who knows where the recipes have come from or who created them, but there are some real gems in there. And there are some oddballs…generally involving Jell-O. Among the index cards there are many scrapes of paper….snip-its from newspapers and magazines. All yellowed from age and bit more fragile. All cut out, possibly on a lazy Saturday afternoon, a few or maybe many decades ago, with the intent to create a dish to be shared with family and friends. This coffee cake recipe is from my mom’s recipe box. While I am not sure if the person that cut it out – be it my mom or my grandma, ever made it…I am glad that they took care to save the recipe and while it may have taken longer than expected, the cake was finely baked and enjoyed. 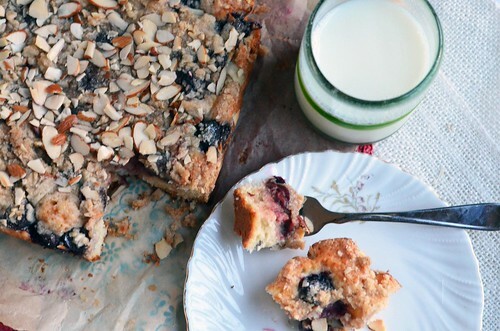 Coffee cake is great for weekends. Weekends busy or slow. Lazy or bustling. With or without visitors. And leftovers (if there are any) are great for getting through those dreaded Monday mornings! 2 Tablespoon Slivered Almonds, plus extra for finishing. Preheat oven to 350°F. Butter and flour the bottom and sides of a 8 x 8 inch pan. Combine thawed and drained cherries with almond extract. Let sit while the rest of the cake is prepared. In a large mixing bowl, cream together butter and sugar until light. Mix in vanilla, egg, and lemon zest until well combined. Slowly add in the flour mixture, alternating with the greek yogurt – starting and ending with the flour. Spread batter into prepared baking dish, it will be thick. Use a rubber spatula to spread it evenly into the pan. Set aside and prepare the streusel topping. In a medium sized bowl, combine the cinnamon, sugars, flour, and almond slivers. Cut in the butter using two knives, pastry cutter, or your fingers. Cut in the butter until it looks like coarse meal/butter pieces are about pea size. This is the topping. 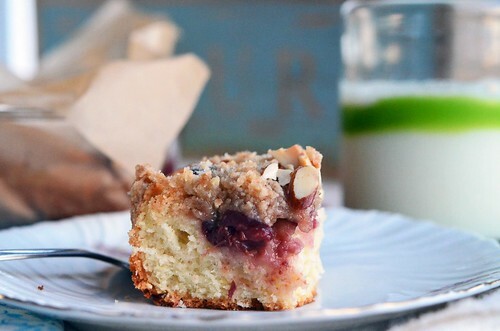 Evenly spread the cherries over the cake batter and top with streusel. 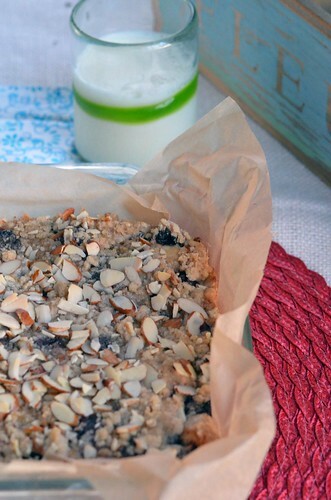 Sprinkle extra almond slivers over the cake. Place cake in preheated oven and bake for about 30 to 35 minutes until toothpick comes out clean. Let cool for at least 10 minutes before slicing and enjoying.